The following essay was originally published in the March/April 2011 issue of Cooperative Living magazine. 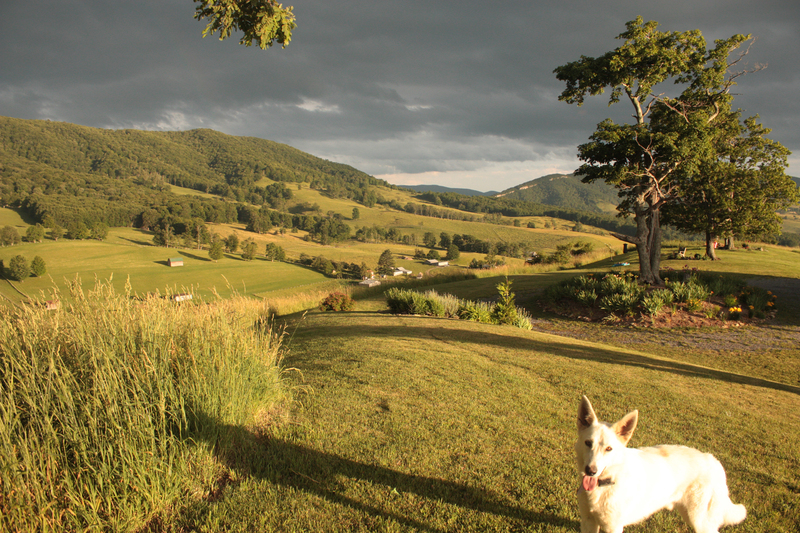 Spring comes late to my home in Virginia’s Blue Grass Valley, this otherworldly place of high-elevation pastures and undulating ridgelines, with winter often extending into April. But when that last bit of snow slips down through the soil to rejoin the limestone earth and the whole valley flames fresh green from the swales of the creek beds to the tops of the sugar maples that crown Lantz and Monterey mountains, it seems no great thing to have waded through six months of winter if this rebirth is the reward. We humans are not so unlike the landscape that surrounds us. Like yellow jonquils and redheaded tulips that press forth through thaw-softened earth after their annual slumber, we sometimes lie dormant as winter for years until the opportunity comes for us to throw off the mantle of our former selves and transform into something akin to spring. Like the grass beneath our feet, we find ourselves changing and expanding with the seasons of our lives, often imperceptibly but occasionally with great force like the reinvented course of a mountain stream after a flood. Last May, as Highland County was bursting into bloom, I crossed the ocean to revisit the land of my not-so-long-ago ancestors, those who had come here only a century before, to carve a life out of the black soil of the American Midwest, daring to leave life as the children of Norwegian cotters for the prospect of becoming landowner farmers in a landscape far different from the sidelong pastures of the Tresfjord where they were born with the smell of the sea always peppering the breeze. Standing in the churchyard in western Norway where my great-great-grandfather was baptized, reading the family names across the gravestones — Naerem, Sylte, and Knutson — was to me a vivid reminder of the transformation my ancestors undertook all those years ago, hoping that by transitioning from one landscape to another, from the hardscrabble slopes of the Norwegian fjords to the thick black soil of the American prairie, they would transform their destinies. And so they did, making a way for themselves, and for those of us who would follow, in a world without abject poverty, without the press of landlords, without the hardship of carving a living out of mountainsides more rock than soil. When I came home again, America looked different, transformed. But it was I who had changed. I had witnessed the power of place in changing destiny. I had seen firsthand how impossible it would have been for me to be who I am or do what I have done had my great-great-grandparents not been brave enough to change their lives forever. And I began to comprehend at last what my college mentor had meant all those years ago when he talked of “the right to rise,” our American birthright. He, too, knew the transformative power of leaving one landscape to join another, having come of age in a ghetto in Nazi-occupied Budapest as a Hungarian Jew. It was his father who enjoined him after the Communists came to power to risk a border crossing and find his way to America. And so he did, landing in New York City with $1 in his pocket. He read the speeches and writings of Abraham Lincoln to teach himself English and is today, more than half a century later, one of the world’s foremost Lincoln scholars. I do not know, given his hopes I would become a historian, too, if he would understand my less-dramatic change of setting — why I emptied all my savings almost a decade ago to purchase a house and land in Highland County with no immediate prospect of employment, only the hope that I could do as I had long dreamed of doing, to make my way in the world as a writer in a landscape I had loved since childhood. Certainly no one else in my life understood. But I had already learned, by that point in my life, that change, transformation, rebirth, do not come without risk, and rarely do they come without suffering. And when, at age 26, I came to Highland with the first carload of my life packed in boxes to find my driveway flooded by the snowmelt of early spring, the creek overflowing its banks, and coursing a foot or more over the dry ford, I laughed, rolled up my pants legs, and proceeded to carry my life, box by box, across that stream to my new home, the first of many challenges that would face me in the years to come. And since that spring almost a decade ago, I have found my life transformed many times, frequently by landscapes, sometimes by people, and occasionally by pain. All the world’s major religions refer to these journeys of transformation and rebirth, how they are little removed from the journeys of the grass and trees that die back each winter to be reborn again in spring. But if you are not in tune to these cycles, as the farmer is to the character of the soil, it is easy enough to miss the opportunities they provide. It is not every seed that finds its way through the topsoil to become a walnut tree. Did my great-great-grandfather know when he boarded that ship in Molde, Norway, that he was changing the course of history for all his progeny? Did Gabor Boritt know when he ran across the heavily guarded Hungarian border into Austria that he would one day receive the National Humanities Medal from an American President? Do any of us know when the chance comes to change where that change will lead? We do not, of course. And sometimes we do not even recognize the chance, or we fail to embrace it out of fear, forgetting this is the natural cycle of things — change and rebirth, like the re-greening of the landscape in spring. But imagine if the snowdrops and crocuses failed to break through those last patches of snow, if the maples did not uncurl their new springtime leaves, if the pear and crabapple blossoms did not spray the hillsides in white and pink. Each year they return, a little more brilliant than the year before. And so must we, remembering always how like brown grass and winter tree limbs we would be if we did not have the courage to embrace our own opportunities for renewal, whether those transformations come through the power of place, through love lost or gained, through pain overcome, or through the simple daring to be fully present in this — the lovely landscape of our own human lives.